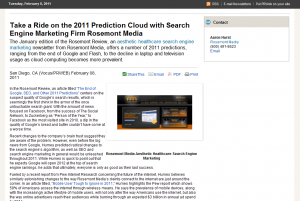 The January edition of the Rosemont Review, an aesthetic healthcare search engine marketing newsletter from Rosemont Media, offers a number of 2011 predictions, ranging from the end of Google and Flash, to the decline in laptop and television usage as cloud computing becomes more prevalent. In the Rosemont Review, an article titled “The End of Google, SEO, and Other 2011 Predictions” centers on the suspect quality of Google’s search results, which is seemingly the first chink in the armor of the once untouchable search giant. With the amount of news focused on Facebook, from the success of The Social Network, to Zuckerberg as “Person of the Year,” to Facebook as the most visited site in 2010, a dip in the quality of Google’s bread and butter couldn’t have come at a worse time. Recent changes to the company’s brain trust suggest they are aware of the problem. However, even before the big news from Google, Humes predicted radical changes to the search engine’s algorithm, as well as SEO and search engine marketing in general would be unleashed throughout 2011. While Humes is quick to point out that he expects Google will open 2012 at the top of search engine rankings, he adds that ultimately, everyone is only as good as their last success. 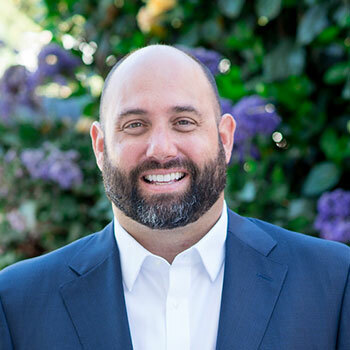 Fueled by a recent report from Pew Internet Research concerning the future of the internet, Humes believes similarly astonishing changes to the way Rosemont Media’s cleints connect to the internet are just around the corner. In an article titled, “Mobile User Tough to Ignore in 2011,” Humes highlights the Pew report which shows 59% of Americans access the internet through wireless means. He says the prevalence of mobile devices, along with the increasingly active lifestyle of mobile users, will not only alter the way Americans use the internet, but also the way online advertisers reach their audiences while burning through an expected $3 billion in annual ad spend by 2014. Another reason for the downfall of the traditional desktop or office setup is addressed in an article titled, “3 Reasons the Cloud will Benefit your Practice.” Focusing on the desire for constant connectivity in all walks of life, from personal to professional, Humes discusses the inevitable move toward cloud computing and the expected effects this shift will have on their aesthetic healthcare clients. At the end of the day, Humes says the majority of Rosemont Media’s clients depend on the firm for a multi-faceted approach to social media and search engine marketing, medical or dental website design, and much more. The Rosemont Review is designed to create an easy-to-digest assessment of the latest internet and technology news, and how it will affect the company’s aesthetic healthcare clients. As the Modern Ad Agency, Rosemont Media focuses on providing innovative search engine marketing campaigns and custom website design for plastic surgeons, cosmetic dentists, bariatric surgeons, and beyond. The San Diego firm operates under the strictest terms of market exclusivity to create the ultimate competitive advantage. Rosemont Media is located at 1010 Turquoise St. Suite 201 in San Diego, CA 92109, and can be reached at (800) 491-8623. For additional information on custom website design, SEM, SEO, and SMO consultancy, online reputation management services, and the overall RM advantage, visit www.rosemontmedia.com or the Rosemont Media Facebook page. To stay up-to-date on the latest internet and technology news, and how it influences the aesthetic healthcare industry, visit the Rosemont Review.